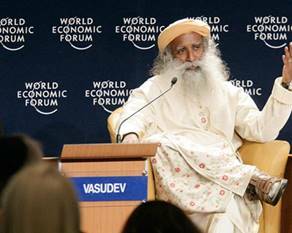 Named one of India’s 50 most influential people, Sadhguru Jaggi Vasudev has addressed prominent global forums on issues as diverse as socio-economic development, leadership and spirituality. He has served as delegate to the United Nations Millennium Peace Summit and the World Peace Congress and has been a special invitee to the World Economic Forum , the Australian Leadership Retreat and TED. His interviews are featured in The New York Times, BBC, Bloomberg, CNNI and CNBC. He is the author of over 50 books, the subject of four books and co-author of the Amazon bestseller “Midnights with the Mystic.” His public talks frequently draw crowds of over 300,000 people. Sadhguru is also a founder of Isha Foundation, a non-religious, not-for-profit organization with over 200 centers worldwide and over one million volunteers.